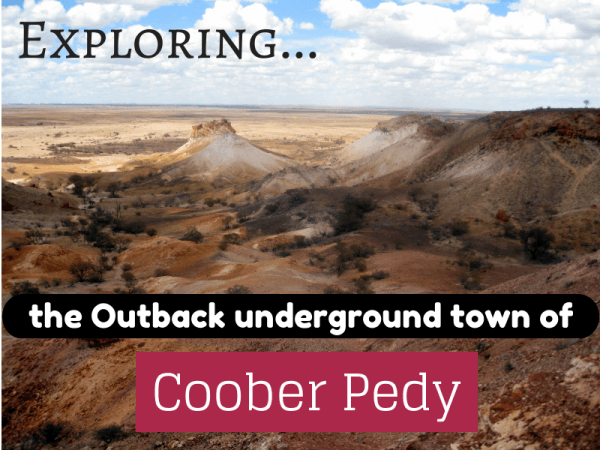 Ever heard of the town of Coober Pedy? Coober Pedy is a small town (less than 2000 people) in the Outback of the state of South Australia, about 9 hours south west of Uluru. It is known as the opal capital of the world, supplying 80% of the world’s opals. 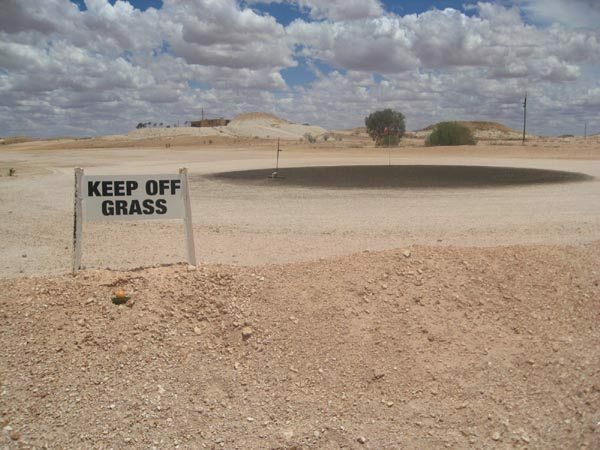 “Coober Pedy” is actually a corruption of aboriginal words and means “white man hole in the ground”. It is surrounded by desert and there is very little around. 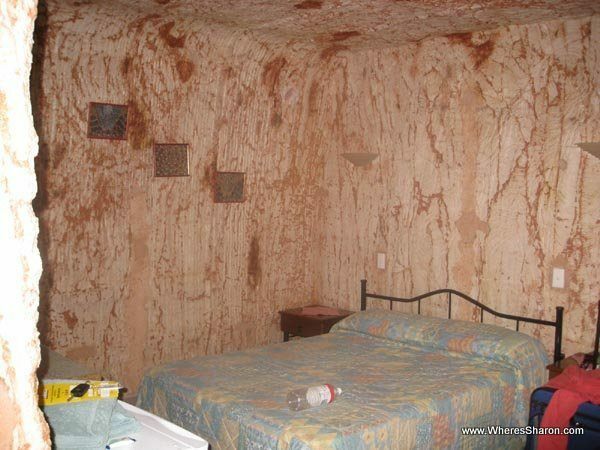 However, if you want to go to somewhere totally unlike anywhere else on this planet, you need to go to Coober Pedy. When I was 10, my grandparents retired, bought a campervan and set off around Australia. They sent home postcards and presents and the only one that really sticks out in my mind now was an opal necklace. Probably because of the stories that came alone with it. 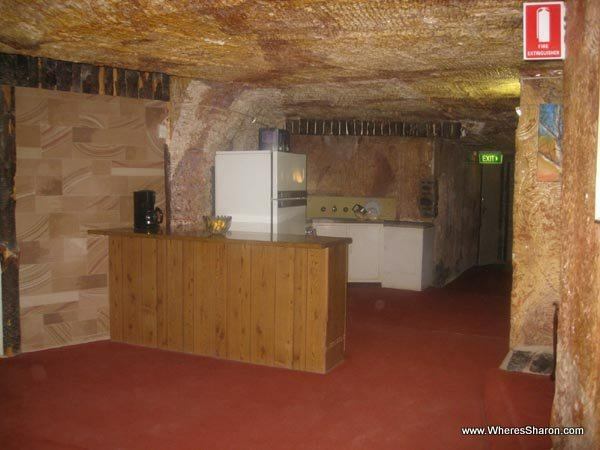 The idea of houses and hotels underground captured my imagination and Coober Pedy became the number 1 place I wanted to go. Fast forward 19 years and I had just come back from nine months overseas and had some time to fill in before I had to return to work. What could I do with this precious time? 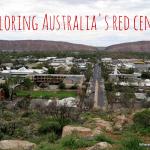 I decided to fly to Adelaide for 5 days, hire a car and drive up to Coober Pedy and back. J wanted to go back to work (strange hey), so I took my youngest sister and brother with me for the ride who were 14 at the time. It is not a straight forward place to get to. It is in the middle of nowhere so this means either a long drive from Adelaide or Alice Springs while passing pretty much nothing or flying on a pricey regional airline. 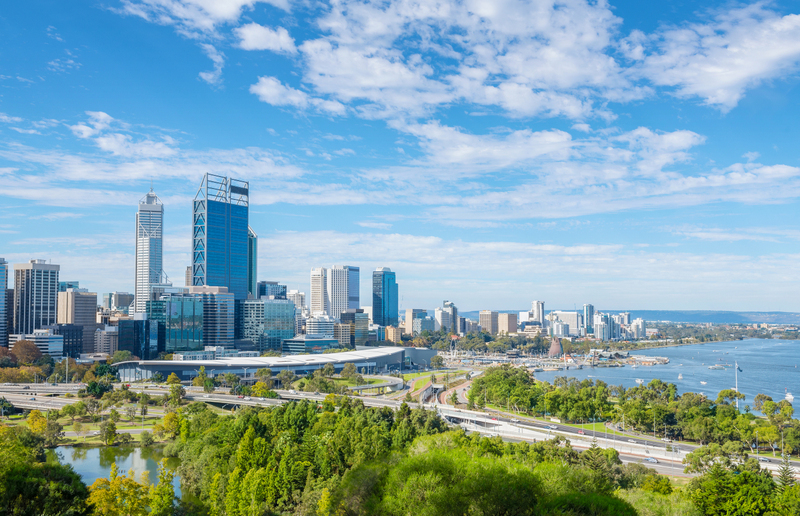 We decided to fly to Adelaide from our home base of Melbourne and then drive from Adelaide. This saved me a lot of driving and the hire car worked out well. The drive takes about 9 hours. The first 3.5 hours are along the A1 highway and is normal highway driving. The next 5.5 hours are straight up the Stuart Highway that runs all the way up the middle of Australia. People talk about it being boring and I can see their point. It is pretty much dead straight, there are barely any towns, and you are surrounded by desert. I, however, found it fascinating. 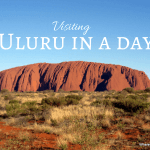 Despite having seen much of the world, I had only just visited the Outback for the first time a few weeks previously when J and I visited Alice Springs and Uluru. We flew to Alice Springs, so we were just suddenly there. It was far more interesting driving and watching the landscape change from green to dust. WARNING: You do have to be careful about filling up on petrol when you get the chance, there can be hours between petrol stations with nothing in between. You also have to be weary of “road trains” – massively long trucks that roar up and down the Stuart Highway. There are more things to do in Coober Pedy than you might imagine for such a small town. This centre consists of exhibits, a documentary about the area, a guided tour of typical underground homes and an opal mine. It was very interesting and I learned a lot here, like why people live underground. I thought it was to escape the heat. This is partly true but it was mainly due to lack of timber in the area. People used to walk six days to get here, and they weren’t able to bring enough timber to build a home. Today, it is also cost effective. It is very cheap to build an underground home. We were told it could cost less than $50,000 to buy your land, build the tunnel for your house, add wiring, etc. Building a house above ground costs far more. The other plus is that you might find some opals when “building” your new home. Some people find enough opals during this process that they actually make money! Australia loves its “big” things and in Coober Pedy, you will find the Big Winch. It is located on top of a hill in the middle of town and there are views over Coober Pedy from here. Coober Pedy’s first “tree” is also here – it is made from iron! There are now trees all over Coober Pedy. This is because the council recycles all waste water except from toilets and uses it to water people’s gardens and public areas. There are public areas where you can “fossick” for your own opals. These areas are the the big piles leftover from when machines build new mines. They check for opals as they go, but sometimes they are missed. Noodling, or fossicking, is going through these piles. We didn’t have much luck, but it is definitely a must do thing to do in Coober Pedy. There is an underground church and a cemetery unlike any other I have ever seen. It has a lot of character. Many graves have chairs next to them so you can be more comfortable while chatting with your dearly departed. One grave even had a keg instead of a headstone with a sign saying “have a drink on me”. 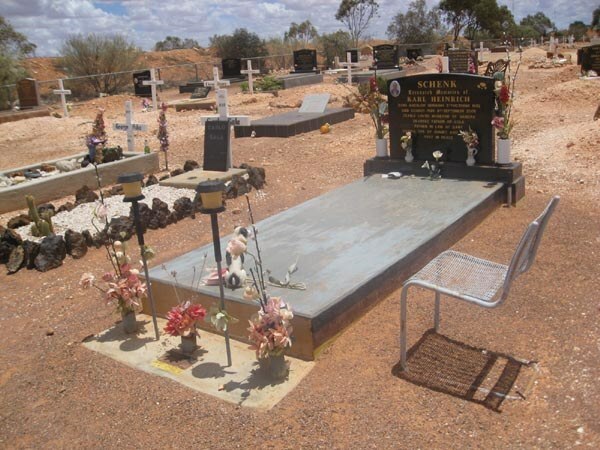 It is normal for people in Coober Pedy to visit the cemetery regularly and have a drink with their loved ones. Coober Pedy is home to a unique golf course. Crocodile Harry is an infamous character of the area who has passed away, but the council has kept running his home as a museum. There is quite a collection of things on display that people from all round the world gave him while visiting his home. His home was used for filming in Mad Max 3 and now is maybe better known for all the underwear hanging up in there from many different women. The rumor is that the first person to give him a bra was Tina Turner while filming Mad Max. It is also rumored that he was the inspiration for the Crocodile Dundee films. The Breakaways are a stunning example of desert scenery – you can see them in the top photo in this post. The colourful landscape is breathtaking – and not just the landscape. Temperatures of up to 65 degrees have been recorded here! 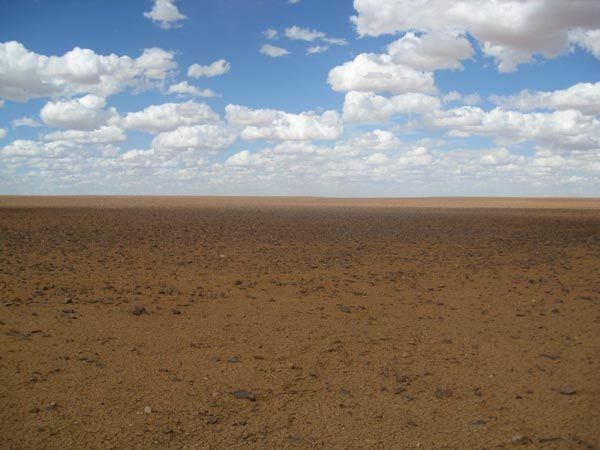 The moon plains is a totally desolate part of the desert. The lunar like landscape is quite unusual, made even more so as it starts right next to more “normal” looking parts of the desert. It is like someone drew a straight line to mark its border. The ground feels quite soft, so it can be fun to imagine that maybe we were walking on the moon! In my opinion, there is no choice but to stay in an underground hotel. There are above ground options if that idea terrifies you, but if you’ve made it all the way here, I think you owe it to yourself to stay underground. There are many options to do this. I loved my visit here. I loved seeing the different parts of desert – I am still amazed how many “shades” of desert there are and how it can just suddenly change in a straight line cutting across the desert floor. I enjoyed looking at opals and learning about the underground houses. It was definitely novel and fun to stay in an underground hotel. We were here in Summer and, although it was hot, it was bearable. 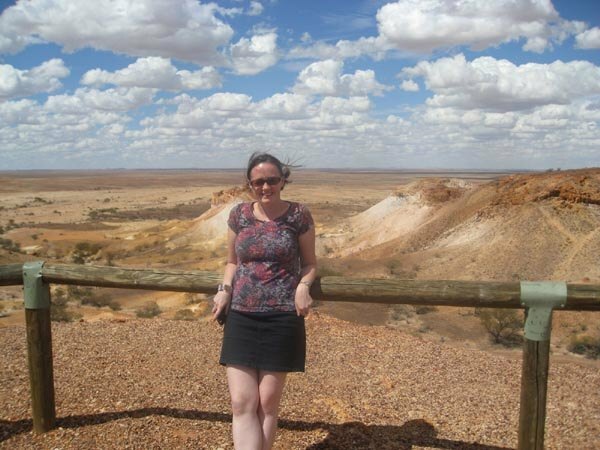 I liked my stay in Coober Pedy more than my trip to Alice Springs and Uluru. 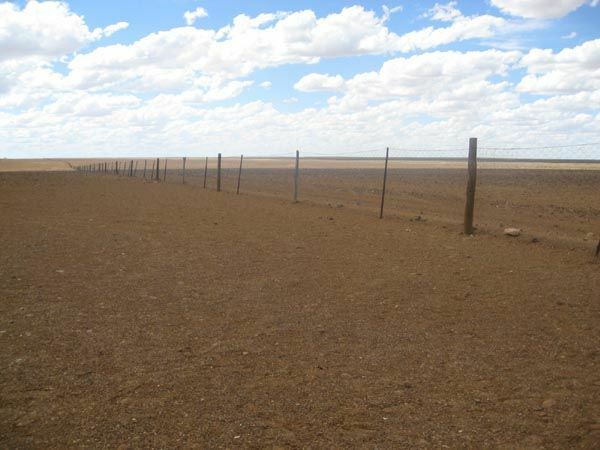 If you can make the time on a trip to Australia and you want to check out the Outback, definitely try to make it here! Have you been to the Outback? 11 awesome things to do in Havana on a budget! Moon Plains is incredible! I have been in love with desert since my very first to Egypt when I was 8 or 9 y.o. Was it very windy there? The train now stops for several hours, to allow their passengers to take one of their tours to Coober Pedy. Wow, great photos, Sharon. The landscape looks pretty Canarian in places. Especially the Moon Plains. Sharon, thanks for a great article about Coober Pedy. I haven’t been there yet, but we HAVE visited White Cliffs in NSW which is a great alternative. It is also an opal mining town and people mostly live underground as well. I hadn’t heard of White Cliffs but I have now spent the last hour reading your site and building itineraries in google maps! I already wanted to go to Broken Hill and it isn’t much further – although it does start being a long way from Melbourne. Thanks for telling me about it. Sharon, I can definitely recommend Broken Hill as well. From Melbourne I would suggest the following rough itinerary (or in reverse). Day 1: Drive to Echuca, explore. Day 2; Drive to Mildura. Day 4: Drive to Mungo National Park, do ranger guided tour of the Walls of China. Stay overnight in area. Day 5: Drive to Wentworth, visit Perry Sand Hills (to north of township). take a proper snow toboggan to slide down hills. Continue drive to Broken hill. Day 8: Drive to White Cliffs. Stay 2 nights in the Underground Motel. Take a full day to explore the area. From White Cliffs you have a couple of choices depending on how much time you have. You could head straight south back to Melbourne via Hay and Echuca (if you do this you could skip my earlier Echuca suggestion and visit on your way home. Or you could head further east to Cobar and Dubbo, go to the zoo and then head south back to Melbourne from there. Thanks!! 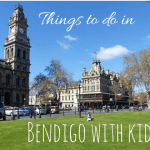 I hadn’t even thought about Dubbo… I think our zoo membership gets us into the zoo too! I really need my kids to hurry up and get old enough so that I feel confident enough to travel with them alone as this is so tempting. I recently saw a show about Coober Pedy and the underground houses; as well as the opals. Looked interesting and my curiosity was tweaked. It was good to read about your experience, thanks. I really, really loved this post Sharon. 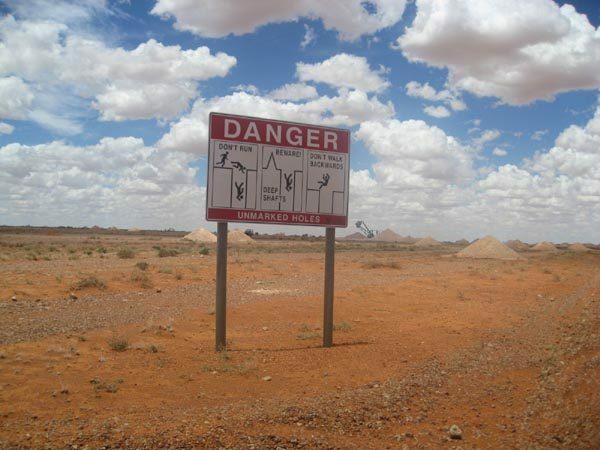 Coober Pedy has been on my list for a VERY long time – I have been to Oz 4 times, but every time Coober Pedy seems to elude me! I’ll print this out and bring it along next time. Thanks! Ohhhh I wanna go noodling for opals, just cause it sounds so cool. I sadly never made it to the Outback when I was in Australia, but I’m determined to get back there, just for that reason! That underground hotel looks very cool. Yes it was cool – both in temperature and experience! It felt like we were totally escaping the world. 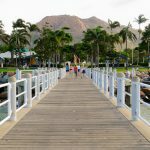 What an incredible place – and love that you always wanted to go there because of your grandparents. This is a lovely piece of storytelling. you had me at Opals! I’m not a big jewellery girl but I’m a sucker for anything Opal- I guess I’ll just have to add Coober-Pedy when I finally make it over to Australia! Having lived in Aus for three years, missing CP was one of my top regrets. Great pictures. You had me at noodling for opals–how fun! Great post. I’ve been into a few of these caves many years ago; lots of fun! Thank you for sharing your experience Sharon. I lived in Coober Pedy for 16 1\2 years, and I loved living there. I had the opportunity to learn so much whilst there that I never would have had the chance to do if I grew up in the city. Thanks Suzie! For sure, I look forward to taking my own kids sometime. This post brings back a lot of memories, it was definitely one of the most interesting places I visited during my working holiday in Australia. Seeing a golf course in the middle of the desert is something I won’t forget in a hurry! Coober Pedy is definitely a very unique destination! !